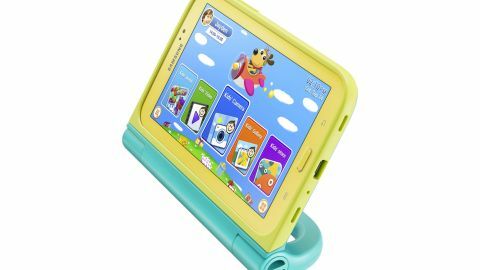 With hardware that was slow enough when we reviewed the standard Galaxy Tab 3 a few months ago, all you're really paying the premium price for here is the case and the Kids Mode interface. First of all, this isn't a new thing. What Samsung has done here is take its existing and rather low-spec Galaxy Tab 3 and whack it in a yellow case, rebranding it as the Galaxy Tab 3 Kids in the hope generous parents might buy it for their little ones regardless of how many cores it has inside. This means you, or your lucky child, get a 7-inch tablet with a relatively low-resolution 1024 x 600 display, powered by a positively budget sector 1.2GHz dual-core processor. There are two things that make it worthy of investigation, though, thanks to Samsung selling it with two extremely robust cases, and also providing a super-secure and completely separate Kids Mode alternative Home screen that lets parents control every aspect of their child's tablet time. The RRP for the Galaxy Tab 3 Kids is around the £199 (around $229.99, AU$260) mark, although it's available for about £150 (around $199.99, AU$225) online. Which is quite a premium price for a 7-inch Android tablet these days, especially as the specs suggest this is mutton dressed as lamb - and the standard Galaxy Tab 3 can be picked up for nearer £99 (around $169, AU$190). The hardware, then, is exactly the same as that offered by the Galaxy Tab 3. You get Samsung's traditional physical Home button, with Menu to the left and Back to the right. Beneath the central button is the Micro USB connector, which lets you fill the Tab's generous 4000mAh battery. There are two cases provided, an orange rubber thing and this extremely impressive Junior Businessman-style case and holdall, which also combines a kickstand with a hole in the hinge to house the stylus. This is by far the best reason to plump for the Tab Kids over the myriad other cheap Android tablets, as the stand lifts the tablet while in landscape mode, raising the viewing angle and meaning your poor child won't grow up with such a hunched back from using the thing sat at a table. Samsung's build quality is impressive too. The Tab 3 Kids feels heavy and solid, plus the touchscreen is responsive and survived extensive angry prodding from my son during the course of my tests. And the stylus that comes as part of the briefcase-like case and stand combo is great, allowing a child to live out its wildest marker pen fantasies without actually ruining any carpets or soft furnishings. Around the back there's no flash beside that 3MP camera, so don't go expecting to use this for anything other than joke kiddy photography. What's nice to see are those chunky little rubber feet on the bottom of the case, which help the tablet sit still when being used on a table with the kickstand out. I like the case. The case is great. The case is a five-star accessory. The tablet inside it, though, is a bit of a disappointment.